This former country farm offers spacious rooms, an outdoor swimming pool and free Wi-Fi. It is located 7 minutes by car from the Armenia´s centre, on the road to Eden Airport. Accommodation at La Floresta Hotel Campestre features a rustic décor. They are practical equipped with cable TV and minibar. The private bathrooms have showers. Dining options include La Terraza gourmet restaurant, which serves regional and international dishes and a daily American breakfast. It offers views of the surroundings, such as the bamboo plantation and the cattle ranch. Guests can play a game of table tennis or simply relax at La Floresta´s sun terrace. Children can be entertained at the playground. Free parking is possible and a shuttle service is available up on request. Located in Armenia, Armenia Hotel SA is in the historical district, within a 15-minute drive of Parque De La Vida and Metropolitan Cultural Convention Centre of Quindío. 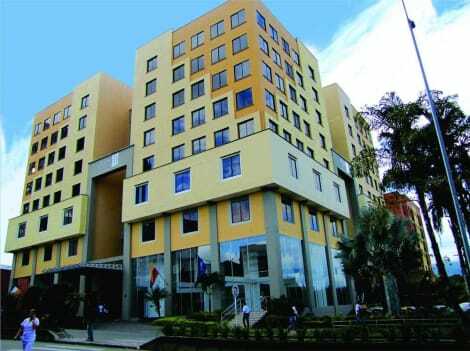 This hotel is 5.3 mi (8.6 km) from Centenario Stadium and 12.7 mi (20.5 km) from Quindio Botanical Garden. lastminute.com has a fantastic range of hotels in Armenia, with everything from cheap hotels to luxurious five star accommodation available. We like to live up to our last minute name so remember you can book any one of our excellent Armenia hotels up until midnight and stay the same night.